This is our latest design of medium voltage switchgear. It is based on a new development of medium voltage circuit breaker that integrates the trip unit into the circuit breaker which is similar to those typically found on low voltage insulated case circuit breakers. This eliminates the need for discrete protection devices and the reliance upon station battery systems. The circuit breakers also feature “Fly-by-Wire” bi-directional communications so that their data can be exported to the Compass Control system for use in the decision-making process and receive commands, via serial communications, to operate the breaker open and close circuitry. The serial communications methods that we engineer provide true control system redundancy for increased operational functionality. 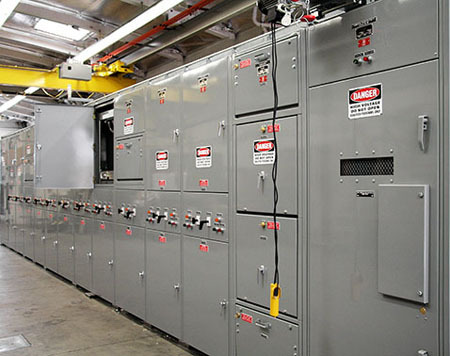 Our latest switchgear ANSI C37.20-based, and compliant, design is metal-clad and can include fusible switch sections as well as open and closed transition automatic transfer breakers. This switchgear features our Compass Control system which enables complete remote control and monitoring of the power distribution system from the safety of a control room atmosphere to provide increased personnel safety and environmental protection. The switchgear has an integral overhead crane to optimize breaker handling. It also features a remotely-controlled breaker racking device to minimize personnel exposure during racking operations. We employ our “Look Ahead” PLC programming algorithms to operate the six existing low voltage substation secondary circuit breakers in concert with the eight medium voltage automatic transfer breaker pairs. Various configurations - service entrance, double-bussed, distribution and transfers, multi-sourced sub-stations, sub-station bypass, etc.